US crude oil inventories: The oil market has been under pressure for much of October, with growing crude oil inventories in the US weighing on the market. US inventories have increased by 22.3MMbbls since mid-September, as refineries reduce run rates over maintenance season. 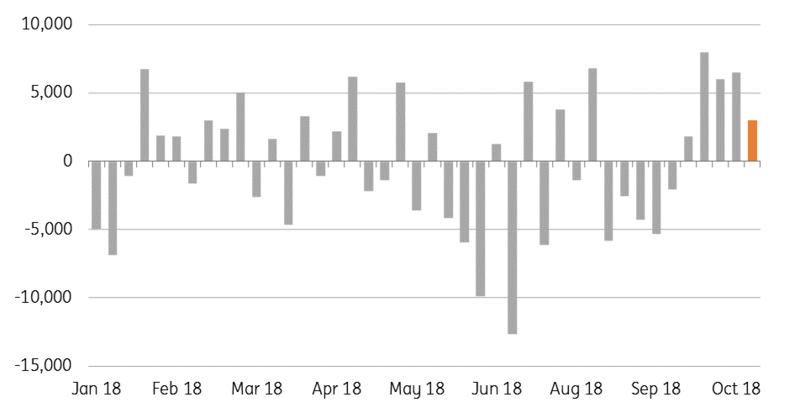 Later today the API will release its weekly inventory numbers, and the market is expecting to see yet another build, with a Bloomberg survey suggesting that crude oil inventories increased by 3MMbbls. ICE Permian crude oil futures: Yesterday saw the launch of ICE's Permian WTI physically delivered crude oil futures contract, which is deliverable in Houston. In its first day of trading, 446 lots were traded, spread across the Dec, Jan and Feb contract. Palladium supply risks pushing prices higher: Palladium outperformed the rest of the precious metals complex yesterday, up nearly 4% as Trump indicated plans to pull the US out of the nuclear arms treaty with Russia. Escalating tensions between the US and Russia does raise concerns over Palladium supply, with Russia making up around 40% of global supply. Chinese metal output and exports: China’s refined zinc production recovered from the lows of 431kt in August to 456kt in September, although still down 10.1% YoY. Smelters have started to increase operating rates, after domestic treatment charges strengthened from US$20/t in August to US$70/t in September and US$115/t in October 2018. Among other metals, refined copper output increased 10.4% YoY to 764kt, while lead output was up 13.7% YoY to 447kt. On the trade side, China’s alumina exports increased 3447% YoY to 166kt in September, on the back of a tight global market. US crop progress: Latest data from the USDA shows that 49% of the US corn crop is now harvested, compared to 37% at the same stage last year, and slightly higher than the five year average of 47%. Meanwhile, the soybean harvest continues to lag last year, with 53% of area harvested, this compares to 67% at the same stage last year and somewhat lower than the 5 year average of 69%. US grain export inspections: Latest export inspection data from the USDA showed that a little over 949kt of US corn was inspected last week for export, down slightly from 1.01mt in the previous week. Mexico was the top destination, taking a little over 231kt. Meanwhile, 1.15mt of soybeans were inspected for export, slightly down from 1.21mt in the previous week. There were no export inspections for China over the week, whilst a little over 290kt was inspected for the EU.